As BP and Rosneft cling to hopes of saving their planned alliance, can a one-month extension to the deal end the stalemate with AAR? A last-minute reprieve granted by the Stockholm Arbitration Court to BP in its struggle to push through a $16bn share swap with Russia’s Rosneft state oil corporation has dramatically fired up the saga of the year’s biggest oil deal. With last Thursday’s extension – to May 16 – of the deadline to resolve the dispute with Russian partners in the TNK-BP joint oil venture, the pressure is on to find a solution. Those partners, a consortium of Alfa, Access and the Renova Group (AAR), successfully argued that the share swap breaches the TNK-BP shareholder agreement. And with AAR effectively now having these giants over an oil barrel, Rosneft president Eduard Khudainatov had little more to say after the deadline extension, other than that he was “hopeful of a quick resolution to the arguments”. BP is now trying to buy back AAR’s share in TNK-BP, and, according to insiders, the sums floated are astronomical. “Together with Rosneft we made a fair offer,” BP’s CEO Robert Dudley said at the company’s annual general meeting in London last week. Sources close to BP say that the sum offered for 50pc of TNK-BP was $27bn. Sources close to AAR called this offer – in terms of both price and assets – “not serious”, and raised the stakes. At first the private Russian owners were ready to sell their share to BP for $30bn, then for $35bn; now they are talking about $40bn – some reports say $70bn – though on the Russian stock exchange the whole of TNK-BP is worth only 1.3 trillion roubles ($46.4bn). Officials at Rosneft are incensed by the demands, which they slammed as “market speculation”. Analysts say BP stands to lose the most if the issue is not resolved: Russia accounts for a quarter of the company’s reserves, so it must remain there to avoid being swallowed by global competitors. Meanwhile, there are signs that Rosneft is keeping its options open in the quest to form a strategic alliance, and realise its ambition of becoming one of the world’s top five oil and gas concerns. Speaking on condition of anonymity, sources close to the Rosneft board of directors said another foreign company might be found to replace BP. But if anyone is keen to explore Arctic oil deposits as BP aims to do, “They are not banging down Rosneft’s doors to swap shares,” said Valery Nesterov, an analyst at Troika-Dialog. The BP-Rosneft alliance was to be effected in two stages. By April 14, the companies were due to have finalised the share swap of 9.53pc of Rosneft and 5pc of BP. The second stage envisages the joint exploration of three areas on Russia’s Arctic shelf. Cue AAR, which, fronted by such formidable figures as Alfa Group’s tycoon chairman Mikhail Fridman, successfully blocked the way. While being a likely source of boardroom palpitations, the share swap saga debunks a widespread notion about doing big business in Russia. The history of the planned alliance vividly illustrates that the influence of administrative resources in private business in Russia is greatly exaggerated. Neither the presence of Prime Minister Vladimir Putin at the signing of the co-operation agreement, nor the support of President Dmitry Medvedev and the chairmanship (until recently) of the “all-powerful” deputy prime minister Igor Sechin on the Rosneft board could save the deal from the claims of the Russian shareholders. In February, the London High Court imposed an injunction on the deal, and in April the London-based Stockholm court extended the ban. The optimal solution to the conflict was allowed to slip away, say observers. “At the very beginning of the confrontation, there was hope that the sides would settle out of court,” said Mr Nesterov. “TNK-BP’s Russian shareholders would receive some form of compensation – money or assets – in exchange for withdrawing their objections to the deal.” AAR has long wanted to enter foreign markets, but the variants proposed by BP (including Arctic exploration) did not suit the consortium. TNK-BP can now either buy back the Russian partners’ package in TNK-BP – for money or shares – or sell theirs. 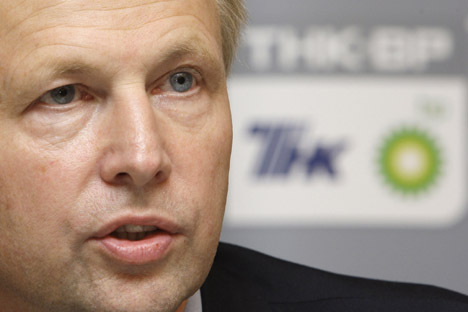 Theoretically BP could find $40bn: at the end of last year it had $18.5bn on its accounts, while Rosneft had $4.1bn, said Boris Denisov, an analyst at the Bank of Moscow. But it now has to sell assets to pay compensation for last year’s oil spill in the Mexican Gulf. Shareholders are unlikely to appreciate such sacrifices. “We are not planning to offer large sums or significant stock participation [to AAR in BP],” Mr Dudley said in an attempt to calm BP’s British shareholders.